Pioneering sound fx website sounddogs.com has just released a desktop sound browsing app. The software allows users to organize and search their own sound fx collections as well as browse the website’s online catalog and – with a $200 yearly subscription – download any sound effect they offer. The Sounddogs.com desktop app is available to for both Windows (10, 8, 7, Vista, and Server (64 bits OS)) and MacOS (10.7.3+, running Java 8+) operating systems. It is free to download and use. The pro version allows access to the entire sounddogs.com catalog for $200 a year ($16/month). What are the differences between the free and paid versions? Add, browse, and use your own sound libraries. The app uses WAV files (only). Use an advanced search to find clips by library, category, or omit terms from keyword searches. “Pin” sound selections to a toolbar so you don’t forget your favourites. Preview audio in an in-app player. Both portions of audio or an entire clip may be selected. Drag-and-drop sounds to folders or the Pro Tools timeline. Either entire sounds or selections of clips can be chosen. Use keyboard shortcuts to work quickly. Browse and audition low resolution previews from the entire sounddogs.com catalog. The online cataloged is browsed via streaming, so naturally an Internet connection is required. While users can browse and hear this catalog, free users cannot download the clips. Instead, links take users directly to the website where they can pay for and download individual clips if they like. Regular license: $200, 2,000 downloads per year. Pro license: $500, 5,000 downloads per year. Premier license: $1,000, 10,000 downloads per year. Download all pinned selections at once. Handy for swiftly transferring of preferred effects chosen while browsing. Note that Sounddogs explain that the use of the app is defined by reasonable professional use. So, abuse of the unlimited downloads policy, such as bulk downloading or whole library downloads, are not allowed. We’ve talked a lot about sound organizers and metadata apps on this website. So, how does the sounddogs.com desktop app compare with others? An earlier article examined over a dozen metadata apps in terms of managing, auditioning, using metadata, and transferring audio. As a free sound cataloging app, it’s not helpful to criticize its abilities in contrast with apps that cost hundreds of dollars. Instead, think of the following of as a way to see if the Sounddogs.com app features fit with your workflow. The app gets full points for its ability to manage audio from local libraries and also from the Sounddogs online library. t does this fluidly and impressively, albeit for WAV files only. How about auditioning tracks? Sound designers with specialized needs may wish for reverse and pitched playback options, however the app focuses on excelling at the fundamental auditioning tasks of simple, rock-solid playback, clip span selection, quick cloud streaming, and waveform manipulation, which the app accomplishes admirably. While extensive metadata editing such as that found in Soundminer, BaseHead, and Soundly isn’t offered, it transfers the original metadata-embedded files from Sounddogs.com’s shop. Of course, complex transferring features such as VST processing are reserved elaborate, expensive apps such as BaseHead, Soundminer, and AudioFinder; that’s not a mark against the app. A comparable option, Soundly, includes additional transferring options of spot-to- bin and timeline, however the Sounddogs app competently transfers files via drag-and-drop to the OS or a Pro Tools timeline. That may be sufficient enough for your needs. A major feature is low-cost access to a massive, well-recorded sound effects library that streams quickly and downloads effortlessly as required. At over 300,000 sound clips, it is a significant content injection for the low price of $16 a month. 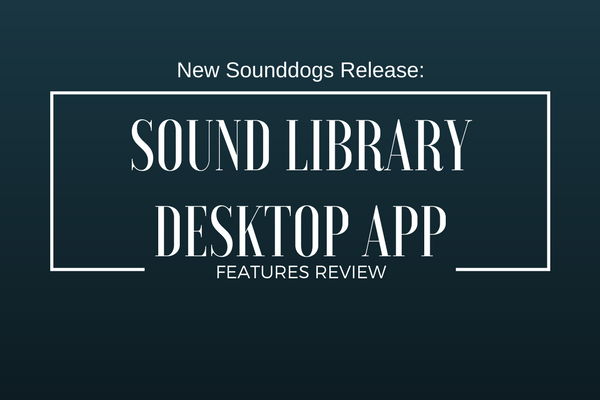 So, does the Sounddogs desktop app replace full-featured metadata software? No, and I do not believe it is intended for this purpose. The sounddogs.com app is a free and simple way to gather, audition, and export your own sound collections. The $200/year subscription instantly expands your sound collection with access to over 300,000 sounds. Visit the Sounddogs.com desktop app page.